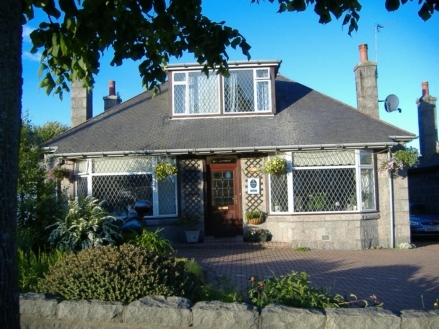 St Elmo is a family-run, smoke-free, four star guesthouse on the north side of Aberdeen, with private parking, on city centre bus routes, within 2 miles of the railway/coach/ferry terminals and 5 miles from Dyce (Aberdeen) airport, and within walking distance of Aberdeen Royal Infirmary and university. All rooms are en-suite, with free self catering facilities (microwave, fridge, kettle, dishes, etc. ), TV/video and WiFi broadband internet access. Nearby are various take-away food shops. Convenient for Whisky/Castle/Coastal Trails, Royal Deeside and Scottish Highlands. Please note, St Elmo is a NO SMOKING establishment. Also, we do not accept bookings including children under 16 at St Elmo, please see our self-catering apartments for family bookings.